European and American salamander species could very well cease to exist thanks to an emerging disease spread by the international wildlife trade if there’s nothing done to stop it, according to new research from the University of Maryland. The new disease — caused by a fungus brought to Europe from Southeast Asia — is already wiping out salamander populations in much of Europe, and will likely find its way to the US relatively soon, owing to the vast illegal/legal trade in wildlife. The fungus in question — Batrachochytrium salamandrivorans — has already more or less wiped out wild populations of fire salamanders in the Netherlands after only just being discovered there last year. The new research was done via the testing of more than 5,000 amphibians across four different continents. As per the findings, the researchers think that the fungus probably originated in Southeast Asia sometime around 30 million years ago, and only just reached Europe through the international trade in Asian newts. The fungus, which is lethal to at least a dozen European and North American salamander and newt species, has not yet reached the Americas, says Lips, a UMD associate professor of biology and one of the world’s top experts in amphibian diseases. Lips and a colleague, Cornell University Professor Kelly Zamudio, screened about 1,400 frogs, salamanders and newts from sites in North and South America and found no trace of the fungus. But Chinese fire belly newts are potential carriers of B. salamandrivorans, and more than 2.3 million of them were imported into the U.S. for the pet trade between 2001 and 2009. If even a few of these animals have the fungus, “it’s a question of when, not if, this fungus reaches North America,” says UMD graduate student Carly Muletz, a co-author of the Science paper. Lips says scientists can act now to track, and ideally prevent, a disease outbreak from ravaging wild populations of newts and salamanders in the Americas. Current US regulations focus on monitoring live animal imports to prevent the spread of diseases to humans and livestock, not to native wildlife, says Lips. She and other experts recently briefed Congressional staffers on the need to fill in this regulatory gap. “If scientists and policy makers can work together on this, we have a rare opportunity to stop an epidemic from spreading around the globe with potentially deadly effect,” states amphibian expert Karen Lips. Given that North America is the center of worldwide salamander biodiversity — possessing over 150 of the world’s 655 known salamander species — if the fungus does find its way here, there will be devastation. B. salamandrivorans rapidly invades salamanders’ skin, which plays a crucial role in the animals’ respiratory system. Scientists don’t yet know how it kills its hosts, Lips said, but a sister fungus, Batracochytrium dendrobatidis, also infects skin, interfering with amphibians’ breathing and their ability to absorb water and essential minerals. B. dendrobatidis infects more than 520 amphibian species around the world, has caused steep declines in populations of frogs and salamanders, and has driven some species into extinction. The scientists fear B. salamandrivorans might prove equally devastating. 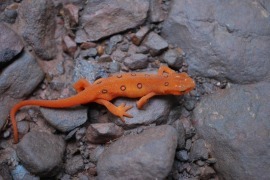 The researchers found that newts, a subgroup within the salamander family, are especially vulnerable to B. salamandrivorans. When two common North American species — the Eastern red-spotted newt, a showy animal often kept as a pet, and the rough-skinned newt, which ranges from British Columbia to the Mexican border — were exposed to the fungus in laboratory tests, 100% of the animals died. The researcher are hoping that their work will lead to the establishment of of a surveillance network capable of monitoring wild salamander and newt populations for the fungus. The new finding were just published in the journal Science.